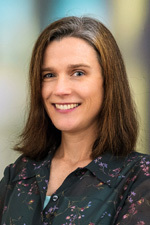 Dr. Evason is an assistant professor at the University of Utah School of Medicine and an investigator in the Department of Oncological Sciences at the Huntsman Cancer Institute. She received her MD and PhD through the Medical Scientist Training Program at Washington University in St. Louis. She served a residency and completed fellowship training in anatomic and liver/gastrointestinal pathology at the University of California at San Francisco, followed by a post-doctoral fellowship mentored by Didier Stainier, Andrei Goga, and J. Michael Bishop. Dr. Evason’s research and clinical interests are centered on gastrointestinal and liver pathology, with a specific focus on hepatocellular carcinoma. She is currently investigating molecular pathways and identifying drugs that influence liver tumorigenesis.